Not just because her music is awesome, but because of a simple gesture on her part. Several years ago she came to the Broadcast Centre for a series of interviews. I’m pretty sure the main interview was for Morningside with Peter Gzowski, because Trish Thornton was still with CBC Radio, and she was Morningside’s tech at the time. I believe Trish recorded Joni performing one of her songs. Then I was booked in the studio immediately afterward to record Joni for another show (I can’t remember which one) while Trish went off on break. 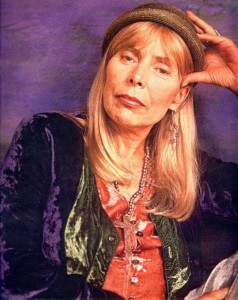 I remember being mildly impressed that the guest was Joni Mitchell. I went into the booth to meet her and the show’s producer and I asked, “So what are we doing? Recording a song?” I was prepared to mic her guitar, do whatever else was required, and I was disappointed when I was told that no, we weren’t recording any music, it was just an interview. So I went back in the control room and recorded the interview. I can’t remember a single thing about the interview… mind you, I’ve recorded hundreds and hundreds of interviews and don’t remember much about most of them. What I do remember is this. To most guests, technicians are little more than pieces of furniture. Or another piece of equipment. Barely human, certainly not worth paying any attention to. So I was always pleased when a guest treated me like a human. The interview finished. The interviewer (I can’t remember who) led Joni out into the hall. It wasn’t necessary to pass by the control room. I thought, yeah, there they go, both of them, ignoring the tech as usual. “It was nice to meet you,” I said, and we smiled at each other.